Pod BK brings the micro-hotel concept across the East River to W'burg. Despite the L Train situation, Williamsburg is hot right now [flame emoji]. Williamsburg is practically an extension of Manhattan, which explains why hoteliers Richard Born and Ira Drukier of Pod Hotels moved its successful micro-hotel concept over the East River. Now, at the intersection of Metropolitan Avenue and North 3rd Street, stands their fourth New York City property, Pod BK. Boasting an inexpensive, interactive experience, Pod BK accommodates the needs of today’s savvy, “young-minded” traveler. The hotel features efficient, clean accommodations ranging from 6-120 square-feet, vibrant communal spaces* equipped with high-tech amenities and free WiFi, plus onsite yoga classes and lush gardens for some real R&R. 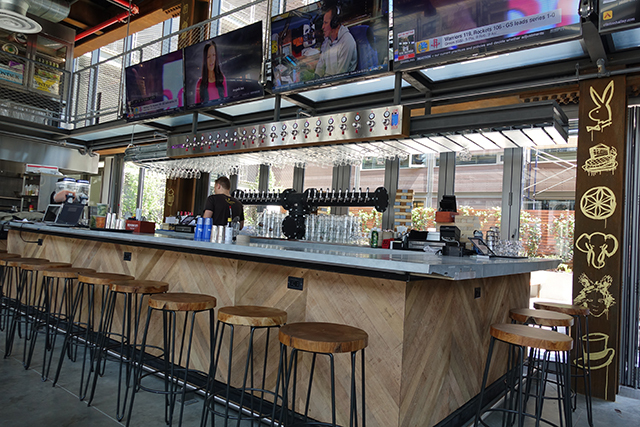 There are two on-site drinking/dining (mainly drinking) options: RFTP, an expansive rooftop lounge – hence the abbreviated name, and Clinton Hall, a modern brewpub/garden. 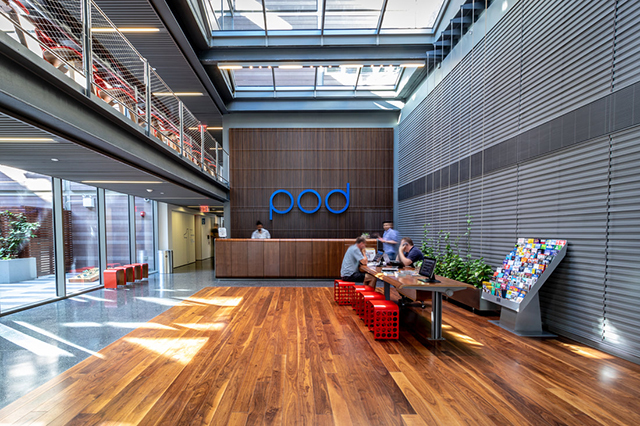 Pod BK is the ideal home for solo business and leisure travelers** alike. In reality though, it’s the temporary home to most in-laws of residents in Williamsburg. 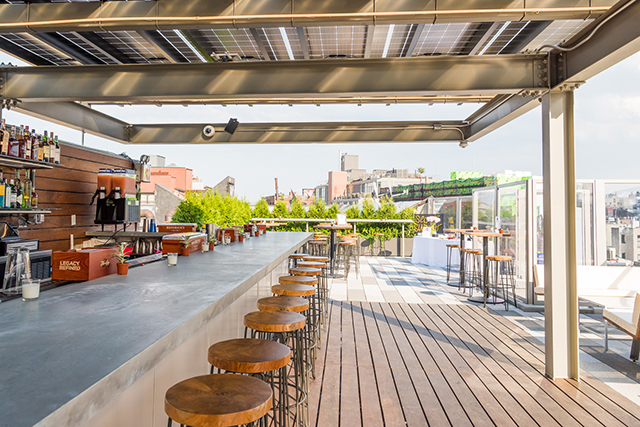 Whether you’re checking in- or out (the space) – pop up to the landscaped terrace for relaxed vibes and rare views of Brooklyn. Much like the hotel, RFTP is modern, minimal and just cool, complete with high top tables, white-cushioned, wooden “banquettes” and zinc bar. Chill with a glass of frosé or flamingo cocktail – yes, you heard that right. The RFTPunch, a boozy blend of Sailor Jerry rum and fresh citrus juices, is served in a pink flamingo cup with sippie straw (see featured image) – much appropriate for these prolonged summer nights. Order now until fall menus arrive. As for fare, RFTP offers a seasonal selection like the “Vegetable Garden,” an assortment of raw vegetables served on a bed of “edible soil” (in the form of quinoa) with a touch of black olive and burnt leek powder (to resemble dirt) with buttermilk ranch dips; in addition to various thin-crust pizzas and a meat and cheese board. Again, order until fall menus arrive. 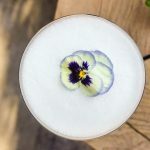 These fall menus we speak of are still a work in progress – do expect toddies and coffees though, and some heaters to really heat things up in the already hot ‘hood. Taste the famous SUPERCRAFT™ beer selection – 20 rotating taps of select draught beers and ciders from US, Ireland, Belgium, Germany and beyond, thanks to the on-site Flux Capacitor. The advanced system regulates draft pressure by controlling the exact gas blend per beer recipe, allowing every beer to be served precisely to the brew master’s specification. Seven large-screen televisions line the bar – most necessary for NFL football action. Belly up with a $25 bucket of wings and mixed craft beer specials every game day/night. Note: This location is the official fan club watch spot for Washington Redskins. 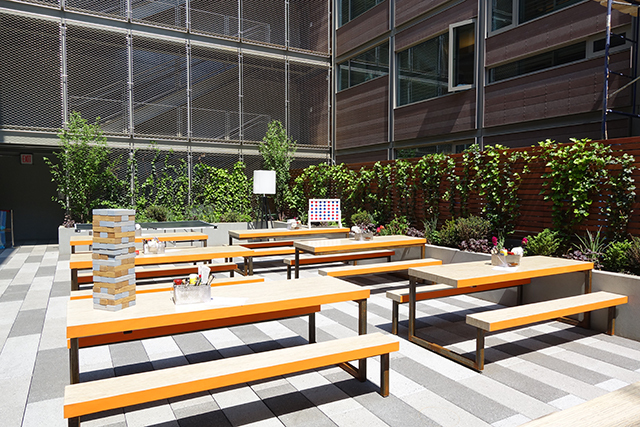 Not this type of Barstool Sports, but a variety of supersized games including Jenga, Connect 4, giant chess, and many more are available in the communal beer garden. Adults can (and should) get rowdy with an endless game of Cards of Humanity. Kids can (and should) demolish the drippy doughnut grilled cheese. 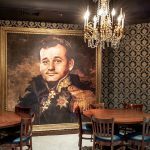 “With our new Brooklyn location, we’ve created an inviting space where guests feel transported out of the city and into a fun environment where they can enjoy amazing food, beer, drinks and games,” said Telly Hatzigeorgiou, founder of Clinton Hall.